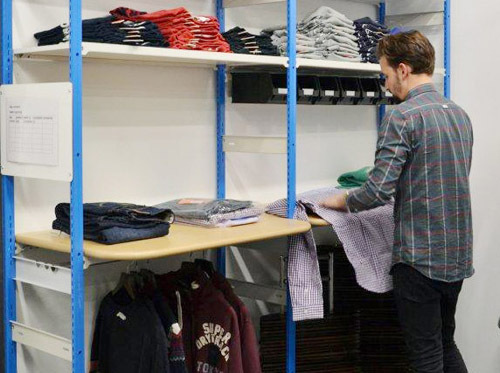 With a typical retail stockroom being small, cramped and full to bursting with stock, it is essential to maximise every available inch of space. The simple inclusion of a work surface within a shelving unit provides an inexpensive and efficient way of incorporating a desk or table into the room without sacrificing valuable storage space. The main photo above shows how a full size workstation can be easily created and incorporated into a racking system by using standard EZR Trimline shelving components. The worktop provides plenty of space for comfortable computer and administration work whilst adjustable high level shelves allow a wide variety of stock items or general supplies to be neatly stored away. Without a standard desk or work table to work around, shelving bays can be arranged in the perfect configuration to maximise stock capacity, pick rates and workflow. 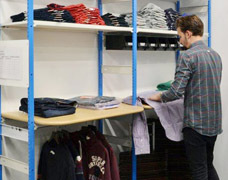 Prep benches and work surfaces can be easily designed into the stockroom shelving system for minimal additional cost, providing practical areas for those everyday stock room tasks such as labelling, folding, tagging and pricing. 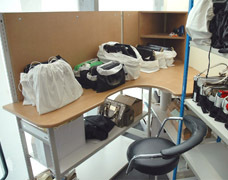 The photographs here show solutions that have been designed for specific stockroom requirements: The first example shows a worktop used within a retail stockroom as a folding table for handling shirts, T-shirts and other clothing garments. 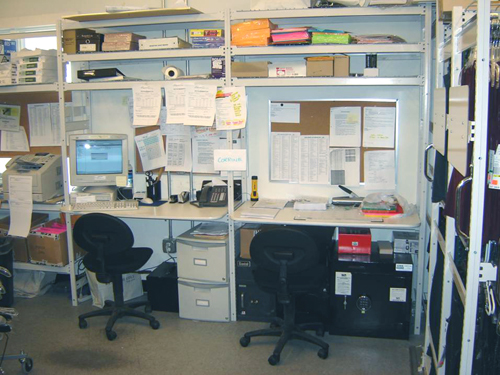 The worktop included within the shelving is set at the perfect height to allow staff members to comfortably work for long periods in a standing position. 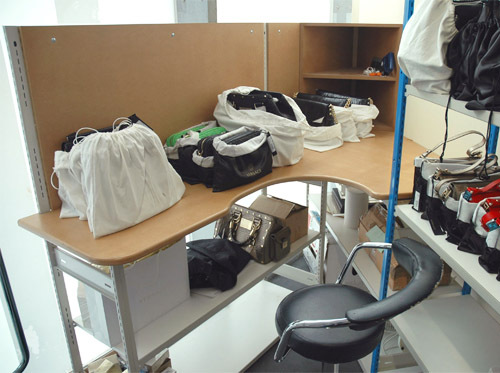 The second example (above-right) is being used for checking and packaging high value handbags and ladies accessories. A large worktop was designed to accurately fit within a previously unused corner of the room with shelving below - a great example of how practical storage and work areas can be incorporated into even the smallest of spaces. Contact us today to find out how we can improve your stockroom with cost-effective stock processing benches and workstation solutions.